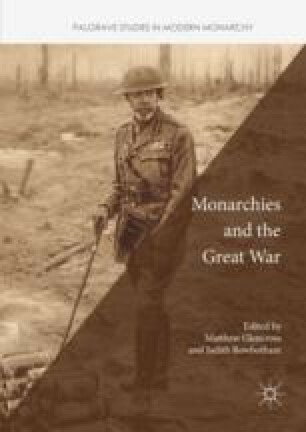 This chapter focuses on another monarch who is not widely familiar today, Victor Emmanuel III. He is popularly best known for his role in World War II, and his association with Benito Mussolini. Yet, as this chapter shows, he used his royal position to play a significant role in shaping Italy’s war efforts. By 1914, he was already an experienced monarch with fifteen years of ruling a problematic and fractured state behind him. Meeting him in 1903, the British King Edward VII had commented that ‘He certainly has all Italian politics at his fingertips’. However, he had not won Italian hearts and minds—but this changed during the war. At the outbreak of the war, the feeling in Italy was not automatically on the Allied side. The political class was uncertain about the levels of popular loyalty to the Triple Alliance, and for many remaining neutral appeared to be a more convenient option than engaging in military action. However, Victor Emmanuel forced the hands of his ministers, by playing a crucial role in the Italian ratification of the Treaty of London. Subsequently, after Italy’s entry into the war, the King was the driving force behind the majority of military decisions made about the extent and intensity of Italian involvement, including the dismissal of General Cadorna. In 1917, during the meeting between British politicians led by the Prime Minister (though George V was also, reluctantly present), Victor Emmanuel was pivotal in ensuring that Italy gained crucial military assistance from the Allies. It is a measure of the King’s importance that Lloyd George, in his memoirs, commented that it had been the actions of the King who, in Peschiera, had saved Italy from defeat. Victor Emmanuel became the ‘living symbol’ of the country. Like his British counterpart, George V, he was determined to be a constant presence amongst his troops on the Front Line, and this made him much loved by his soldiers, who even came to recognize the distinctive roar of the engine of his car. Rudyard Kipling, amongst others, noticed this phenomenon, and wrote: ‘You never know where the King will turn up, but he’s always somewhere along the line, and he never leaves anything unseen.’ Through analysis of newspapers and other primary sources, this chapter explores how the King became a key icon in the popular Italian imagination and a powerful unifying factor for the young nation.